Pot Pouri Sage plant, Salvia dorisiana, is sometimes known as Fruity Sage. An attractive house plant with large velvety leaves and shocking pink flowers. A strong fragrance of mixed fruit, ideal as an ingredient in pot pouri. 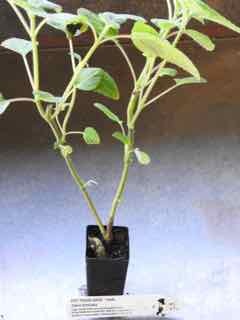 Pot Pouri Sage plant is adaptable to any well drained soil in an open sunny position. Drought and frost resistant. A perennial plant growing to 0.4m x 0.3m. Be the first to review “Sage, Pot Pouri plant” Click here to cancel reply.